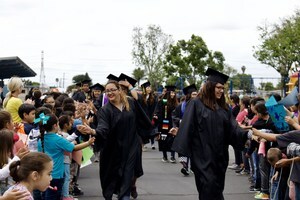 Magnolia School District students were really excited to welcome graduating seniors from Magnolia High School to a “Senior “Walk” at their schools on Monday, May 21. The seniors donned their caps and gowns for a brief “parade” through Maxwell, Salk, and Walter Schools, along with the accompaniment of the skilled musicians in the Magnolia High School drumline. Kindergarten through sixth-grade students lined up along the hallways, held up handwritten signs and cheered for the passing seniors. We were pleased to see some former Magnolia School District students complete another chapter in their education journey. We wish the best to all the seniors in their future endeavors!